Mustang began in the 19th century as the Owatonna Mfg. Co., an agricultural implement manufacturer that has since grown into a 21st century compact equipment powerhouse. Mustang is the second-oldest skid steer loader manufacturer in the world, building its first skid steer in 1965 — the Mustang Series 1000. 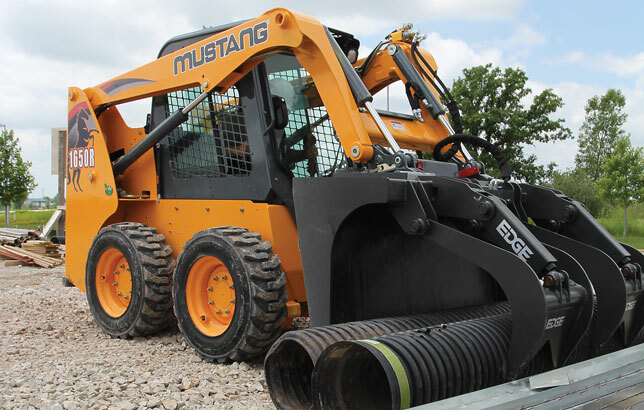 Mustang currently offers a broad range of 11 skid steer loader models. Raw power, a Mustang hallmark says the company, is provided by high-output, high-torque engines on every model. Superior ground-engaging capabilities and cycle-time performance are made possible by advanced, well-balanced hydraulic systems, says the company. Hundreds of attachments are easily interchangeable to expand the uses of a Mustang skid steer loader. The small- to medium-frame Mustang skid steer models include the 1050R, 1350R, 1500R and 1650R. With rated operated capacities ranging from 1,050 to 1,650 lbs, these radial-lift skid steer loaders are characterized by their performance in a compact frame. With engines rated from 35 to 68.4 hp, there is ample power to complete the most demanding of applications. Mustang 1900R, 2200R, 2600R, 2700V NXT2, 3300V NXT2 and 4000V large-frame models complete the skid steer loader range. These workhorses are loaded with features that other manufacturers consider optional, says Mustang. Standard hydraulic self-leveling for performance and mechanical suspension seats for comfort are two examples of many. Mustang models 1900R, 2200R and 2600R are radial-lift-path models, while the 2700V NXT2, 3300V NXT2 and 4000V are vertical-lift-path models. All loaders are equipped with universal, mechanical, quick-attach plates for accepting a range of attachments. A hydraulic power-attach is optional to facilitate easy change-overs. Auxiliary hydraulic flow is standard, as is self-leveling on many models. Operator comfort and safety are provided through a standard Level 2 ROPS structure. The roomy, quiet operator area can be configured to operator preference through a variety of options, including heat and air conditioning. Check out more 2017 skid steer specs here.